Ban'ei horses are from Hokkaido, Japan, where they are used for unique draft races, called the Ban-ei Keiba races, in which the horse pulls a heavy sledge (called a Sori). These races, which are only conducted at four racecourses in Hokkaido, are run by such heavy horses bred from stock such as the sturdy Percherons, Bretons and Belgians, which pull a steel sleigh carrying a heavy load, together weighing from about half a ton to one ton (including jockey, sledge, and harness), along a 200-meter separated straight track with two humps. The dynamic Ban-ei Keiba races, which enjoy a large following, originated as a competition among farmers and locals at least 55 years ago at festivals in the areas in Hokkaido and Tohoku. It started as a competition to test a horse's value for farming from its strength and endurance. Two horses were pulled mutually, and whichever won was more valuable than the other, and so on. It was in November 1946 that Article 9 of the local horse racing enforcement rules was written, which declared that Ban-ei Keiba racing to become public management. Administrative divisions sponsored in 1946, and the city began to manage it in 1953. These horses had been requisitioned as military horses, and there was a rush for production which didn't include quality, and the breeds decreased sharply. It was left to the public management, with two economic reconstruction policies that included increasing the feed production and promoting the Ban-ei Keiba races. Steadily, over time, this sport became popular and was strictly regulated to protect the horses. Interesting points about these races: In the Ban-ei Keiba races, muddy racetracks are an advantage, not a hindrance, as in thoroughbred horse racing. While mud may make it more difficult for a horse to gain footing, most draft breeds are bred to work in wet weather. The sledge is often much easier to pull in the mud than it is over dry ground. The horse also may stop occasionally during the race, to gain footing or get their breath before tackling one of the humps. You could almost consider Ban-ei Keiba races a game instead of a race. 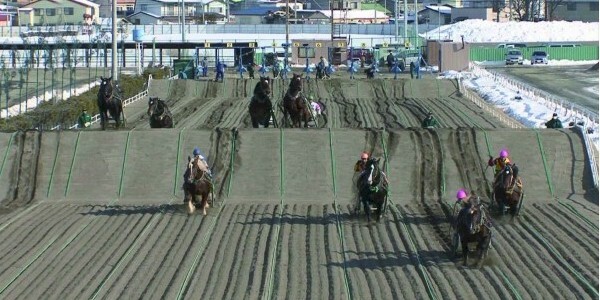 The jockey's skill and technique is much more important in Ban-ei Keiba racing in comparison to Thoroughbred racing. The jockey must decide whether to carefully clear the two obstacles, or whether the horse might be able to attack and conquer them in one run-through without a rest. The horse's speed isn't as important in these races as its endurance is, again unlike Thoroughbred racing. Ban-ei Keiba followers do expect magnificence at these races, they expect dynamic impression. Ban'ei horses are Sorrel, Chestnut, Brown, Black, or Gray. There are three main types of Ban-ei horses, the Percheron type, the Breton type, and the Belgian type. While these horses aren't necessarily purebred, they tend to take on the characteristics of the purebreds of those breeds.